If someone tells you to go to swim in the sea were there are many sharks, would you go? 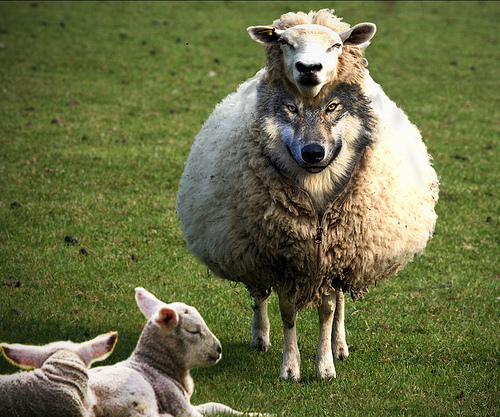 Jesus is telling his disciples to go like lambs in the midst of wolves... is Jesus crazy? Jesus is saying that there is evil in the world and we have to bring change, not by violence but with goodness. That’s why he used the comparison of the lambs and wolves. What are the wolves Jesus is mentioning? In some countries, wolves can be people of other religions who don’t accept Christians and try to kill us... Last week a Syrian Catholic priest Francois Murad was beheaded while extremist Muslims were taking video of him and cheering... wolves who want to destroy those who do good and speak about Jesus. But there are other wolves who are not so aggressive but nonetheless, they try to kill the message that we Christians want to bring. A message that speaks about healing, forgiveness, peace and love. A message of truth. For example, I know a teacher who was falsely accused of things he did not do, because of jealous companions who wanted to destroy him. I know people who try to be righteous, against corruption, and were expelled from their work. We find many wolves who want to feed on others like wolves. People putting obstacles in the business of others so that theirs will flourish. Sometimes even in church, people judge and chismiz on others, trying to destroy the unity and the character of their leaders. I need to ask myself: am I a lamb or a wolf? The lamb according to Jesus are those who bring PEACE... go and bring peace to others. The lambs are those who bring healing to the sick. The lambs are not just the priests. The Gospel is very clear... Jesus sends 72 disciples. Disciples mean those who are following Jesus by listening to His Word and try living it in their lives. So all of us who try to follow Jesus’ words are lambs... and although it is not easy, we still have to continue to be people who bring peace, people who love others and bring healing were there are divisions, solidarity where there is hardship, friendship when there is hatred. One thing is sure... there will be joy for the person who experiences the mission of Jesus. Like the disciples who returned rejoicing, we, too, will feel joy and peace in our heart when we share Christ to the others. Do you want to rejoice? Of course, yes. So be people of peace, love others and don’t be afraid of those who try to stop you.